Home » Astronomy » What is a Meteor? Information about Meteors, Meteoroids, Fireballs, & Meteorites. Early morning meteor. Photo copyright by Simon Filiatrault (click for more detail). Used with permission. Meteors are most often seen as a very brief streak of light in the night sky. They typically occur and disappear so quickly that you wonder if you actually saw them. These streaks of light are commonly called "shooting stars" or "falling stars." Although they are most often seen at night, especially bright meteors can be seen during daylight. 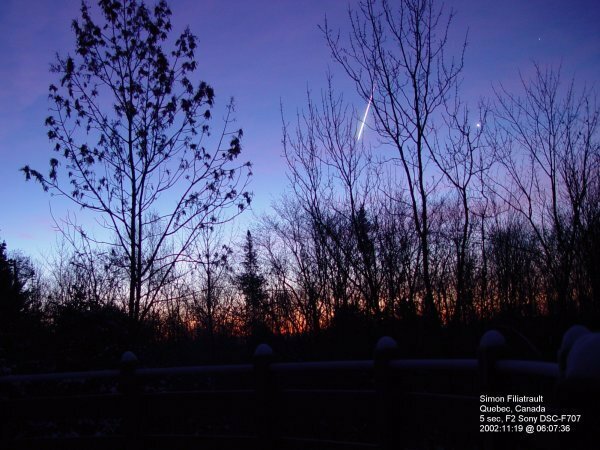 The photo at right shows a meteor in the sky over Quebec, Canada on an early November morning. The streak that we call a meteor is a trail of glowing vapor produced when a small particle of space debris enters Earth's atmosphere. These particles of space debris are collectively referred to as "meteoroids." Millions of meteoroids enter Earth's atmosphere every day. They are believed to originate within our own solar system rather than from interstellar space. Most meteoroids that enter Earth's atmosphere are tiny particles of comets, asteroids, Mars, or Moon that travel through space and collide with Earth's atmosphere. Meteoroids enter Earth's atmosphere at very high velocities. As a meteoroid speeds through the atmosphere, strong drag forces are produced because the high-velocity meteoroid compresses the air in front of it. This compression heats the air, which in turn heats the meteoroid as the air flows around it. The surface of the meteoroid reaches a very high temperature - high enough to vaporize some of the atoms or molecules that are present on the meteoroid's surface. Atmospheric gases along the meteoroid's path are also heated and ionized. These hot, ionized particles produce the trail of glowing vapors that we call a "meteor." Meteors are visible for just a brief length of time because the gases in the vapor trail cool and disperse quickly. 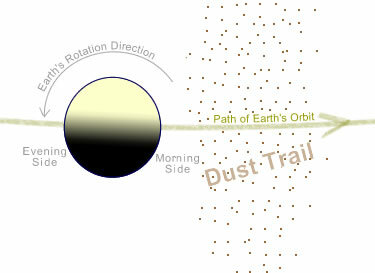 When to see meteors: Simplified diagram of Earth approaching a comet's dust trail. In this diagram, you are looking down onto the Earth's North Pole. Note how the morning side of Earth will plow into the dust, but the evening side will be somewhat shielded. This is why there are often more visible meteors after midnight - you are then on the side of the Earth that is plowing into the dust. When Can Meteors Be Seen? You have a chance of seeing a meteor on any clear night. However, there are about a dozen times each year when an exceptional number of meteors can be seen. These are known as meteor showers. These showers occur when Earth, on its orbit around the sun, moves through a stream of comet debris. As comets orbit the sun, they lose small particles of debris. These particles are scattered through the orbit path of that comet. When Earth's orbit crosses the comet's orbit, many particles of comet debris collide with Earth's atmosphere, producing meteors. During a particularly good shower, hundreds of meteors can be seen per hour. To find out when the next meteor shower will occur, consult the Meteor Shower Calendar. A fireball is an unusually large and bright meteor. To be considered a fireball, the meteor must be at least as bright as Venus. This exceptional brightness is usually a result of a large meteoroid - possibly a few meters in diameter upon entering Earth's atmosphere. When fireballs occur over populated areas, they can generate a large amount of attention. Some fireballs produce an audible noise, some shed smaller meteors, some are accompanied by sonic booms, and some leave a trail that remains visible for several minutes after passing. The large size of fireball meteoroids gives them a much higher chance of surviving their fall through the atmosphere and striking Earth's surface. Most meteoroids are so small that they do not survive their fall through Earth's atmosphere and are completely vaporized. However, some are large enough to fall all the way to Earth's surface. A meteoroid that survives the fall and lands on Earth's surface is called a "meteorite." Each day Earth is believed to gain over 1000 tons of mass from the infall of tiny meteorites. Most of these meteorites are the size of a dust particle or sand grain. Rarely, a meteoroid large enough to be witnessed falls all the way to Earth. 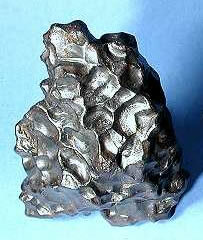 Several hundred meteorites larger than marbles are thought to reach Earth's surface each year. A small fraction of these are discovered by humans and identified as meteorites. This is why meteorite specimens are exceedingly rare. The impact of very large meteoroid can produce a large impact crater. Some of the largest impacts have been associated with catastrophic events, including mass extinction of plant and animal species.